This entry was posted in General News and tagged management, wild pigs on March 22, 2012 by Wire Eagle. AUBURN – Wild pigs have become a big problem in the Southeast as they destroy billions of dollars in crops annually, compete with other native wildlife species, and wreak havoc on forests, pastures and food plots. An Auburn University professor and his colleagues have created a book to help landowners manage the rapidly increasing population of wild pigs. The joint publication of the Alabama Cooperative Extension System and the Mississippi State University Extension Service provides practical information to landowners on managing wild pig populations. The book, titled “A Landowner’s Guide for Wild Pig Management: Practical Methods for Wild Pig Control,” turns scientific research into proven techniques for reducing damage, according to Mark Smith, assistant professor and extension specialist at Auburn University and co-author of the book. The book gives an overview of all things pig, starting with their introduction into North America and ending with how best to trap them. Pigs came to America with the early explorers to provide a stable, reliable food supply for weary seafaring travelers to the continent. Over the years, pigs have been released or escaped into the wild and have formed large populations. Twenty years ago the pigs were confined to a few states in the Southeast and California but now can be found in more than 40 states. Some of this spread is due to population growth but that does not explain the pig’s appearance in places like Wisconsin. Once the pigs are transported and released they set up permanent populations. The book shows the pigs’ population growth and how they can adapt to different environments. Pigs reach sexual maturity at six months and females can have two litters in a little over a year producing on average four to six piglets per litter. Once a sounder, or family of pigs, has settled in the damage begins. It is estimated that $1.5 billion in crops is lost each year to pigs. The damage is not just from consumption. The pigs dig up roots, small invertebrates and developing plants, trample crops, and wallow, all of which destroy vast areas of farm and forestland. Quantifying environmental damage is not as easy but the effects are equally destructive. Rooting, wallowing and trampling all contribute to poor water quality. The pigs can also consume significant numbers of reptiles and amphibians and may pose a significant threat to these species, especially around their breeding pools. The biggest threat may be from interaction with domestic livestock. Wild pigs can carry diseases from one farm to the next and infect farm-raised animals. If a disease appears on a farm it is easy to quarantine livestock but a disease in a free-ranging wild pig population will be almost impossible to quarantine. 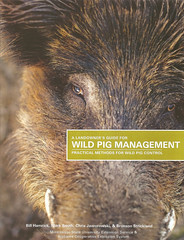 The book explains the many problems with wild pigs and then provides specific instructions on how to trap them. It gives pros and cons of each type of trap and tips on how to construct them. The manual teaches landowners how to lay out bait and condition the sounder to enter the trap every night for a few weeks before springing the trap. “The pigs get used to getting a free meal every night and become greedy,” said Smith. The book ends by giving ethical ways to remove the pigs after they have been caught. “They are still animals, even though they are doing stuff we don’t want you still have to treat them with respect,” said Smith. The book provides information that is valuable not just to landowners with pig problems but everyone. A print copy of the book can be ordered for $5 from the Alabama Cooperative Extension System, or a free downloadable copy is available. For either format, go to https://store.aces.edu/ItemDetail.aspx?ProductID=14291.